boa - duvet TV sized · forums · community | osu! Polka's diff needs updated tags and Renbery's Beginner has an offscreen object at 01:17:771 (1) - (it's like a few pixels but is still offscreen.) polka still needs to apply the mod, but added tags just in case, also did some things on the beginner diff so that the pixel is in the playfield (also changed some slider shapes holy moly what was i thinking). Skipped lower diffs because nubery is KIA. 00:05:728 (5,6,7) - This flow is very awkward to play because of the angle of 6. If anything I'd expect flow like this for 00:06:372 (7,8,1) - because of the downbeat but where it is now feels much more awkward than it has to be. There's nothing in the song too important to emphasize like that either. Vocals seemed more intense there, so broke flow for emphasis. Plus it's kind of my style to have straight angles sliders end away from the start of curved sliders I guess? 00:11:847 (9,10) - Claps aren't in the music, so these don't really have to be hitsounded with claps either. Same for 00:19:578 (9,10) - and the rest. Adds a little bit of... flAVor to the map if you will. 00:20:544 (3,4,5,6,7,8) - Feels weird that this whole combo follows the vocals but it skips the vocal on 00:20:705 - for some reason. Could make a repeat or something if you want the held effect. The vocals don't become intense enough to be mapped until about 00:21:027 (4) -. That vocal I skipped was so minor it really doesnt make a difference whether its mapped or not. 00:30:207 (1) - Wow this is a massive jump from a circle for this difficulty. I would really recommend nerfing this as there haven't been any jumps of this intensity anywhere else for stronger sounds even. 3.47x lol. Well it's not a circle to circle jump so DS doesnt really measure how intense the jump is. Nerfed I think. Sorry to shoot you down I still love you. On this point, while yes I do agree there should be intermediate 1/4, my point was more this is more like the only 1/4 you use. It's very sudden and considering you only used one triple in the map prior it's like... really sudden to have such a long stream. I think making more triples would help this more to give the player an idea of "hey this map will use some 1/4 in it so be prepared" but atm it doesn't really do that until the end where it's too late. Oh no I understand your point! It's 1/3 I believe. Also, it's very slow and the DS is heavily reduced, so while yes, it's kind of a surprise, it's not an earth shattering one, and I think players should be okay. 00:15:874 (3) - Stack on (4)? 00:56:191 (3,4) - stack on (5)? Seriously, that's all I could find. Insane is extremely well done and this whole set seems ready in my eyes. Go go go! 00:02:829 (3) - ctrl+g? pattern so i think so?? thanks for modding and your words, space! Oh hey! Are you close to ranking this? I'm so sorry I didn't check the mods on my diff, sorry I'm not very active in osu lately. If you're not close to ranking then I could check all the mods and apply them to my diff. If you're gonna rank it soon and my diff will mess with it, leave it out. 00:55:225 (3,1) - Others might peg you for this, I think it's super minor, but this is the only part where your difficulty strays to 1.11 vs ~1.0 for all other parts of the song. 00:46:850 (1) - I recommend to move this 5% volume inherit point back a tick because spinners have a hitsound at their ends and there is an audible drumbeat where this spinner finishes. 00:07:982 (3) - I think removing the repeat part of this slider, so it just becomes a normal 1/2, fits the music better. 00:37:776 (8,1) - Consider lowering DS on this jump to ~2.3. It's a pretty huge difficulty spike. 00:47:977 (3,4,5) - Ctrl G on timeline (so it should be circle slider slider vs slider slider circle) because starting sliders on blue ticks can be trippy for Hard difficulties. 01:17:127 (1,2,3) - This felt a bit weird for me to play. Consider combining into one reverse slider that ends on 01:17:449 Also remove NC. 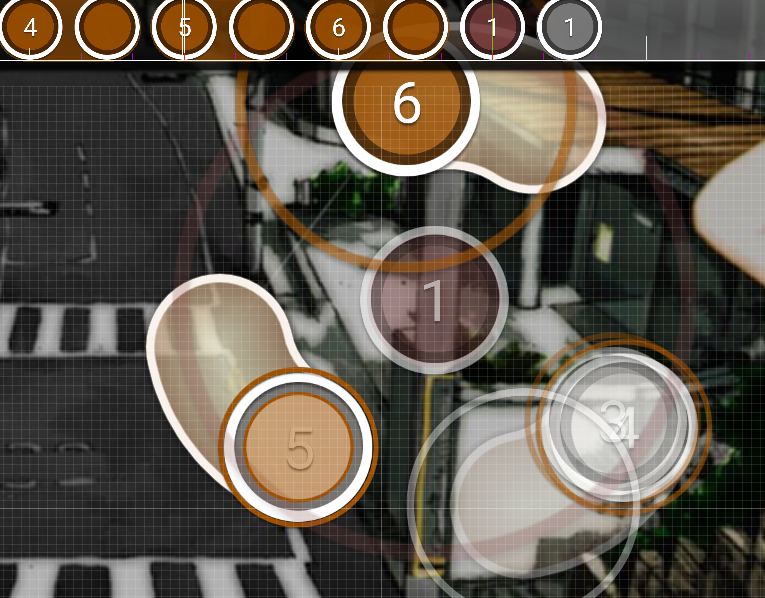 00:06:372 (7) - Ctrl G, I think this plays better with the pattern you created with the previous two sliders. 00:06:855 (8) - Stack on 00:04:439 (1) if you went with above suggestion. Either overlap them more or don't overlap them at all. 00:05:406 (4,1,2) - Try slider slider circle instead to match vocals. 00:07:982 (4,1,2) - circle slider slider fits better in these parts because the vocal isn't adding anything. So by alternating slider slider circle and circle slider slider in these respective parts, you can create some nice variation! 01:11:437 (2) - I would add a drum hitsound on this phantom note just for the sake of continuity. Nice set. Good job everyone! Fixed the slider. I don't like the jump your suggestion creates. 00:46:850 (1) - I recommend to move this 5% volume inherit point back a tick because spinners have a hitsound at their ends and there is an audible drumbeat where this spinner finishes. i was adding more emphasis on the vocal fade out rather than the drums in the background,, i appreciate the suggestion all the same though! Nice set. Good job everyone! thank you for taking the time to mod my map! updated all (including bery since we kinda talked over the only two points that you gave; in short we applied the first one while denying the second >.<) it's also worth noting that i tried to make the hitsounding on some diffs be more consistent (i.e; mkguh, my normal, bery's easy (with permission) and renbery's beginner) and did a major aesthetic remap of normal while keeping the same rhythm for the most part and self-modding along the way; hopefully it's better than my one-year old mapping of this! 00:05:083 (3) - Ctrl+G fits your sharp angle flow pretty well, compare it with 00:02:346 (2,3) - 00:03:634 (3,4) - . You lack emphasis here unnecesarily. 00:13:297 (1,2) - Feels a bit too close together for your regular structure. Consider 1's placement in relation to 00:13:941 (3) - and try and reposition 2 to respect this visual distance. 00:21:027 (1,2,3) - You curved the sliders too much and its causing the blanket to be off. 00:32:140 (1,1) - This sliderborder overlap triggers me xd. 00:52:004 (1) - I would remove NC here and NC beginning on 00:52:648 (3) - then NC on 00:55:063 (2) - here instead. This is a good place to highlight the 5 repeat sliders as their own individual combo and one of the few examples of where i'd really recommend deviating from the standard NC rhythm cuz it just works better visually xD. 01:11:329 (1,2) - I would make this a 2/3 slider instead so you can begin the stream on a more natural note (red tick). Beginning on a 2/3 note is quite awkward for players. 00:16:357 (5) - Okay this is really hard to read especially with the overlaps. 00:47:494 (2,3,4) - Doesn't flow well imo. Pretty clean. Go through ti for blankets one more time though thanks. 00:14:746 (1,4) - In the future try to overlap sliders like this. It makes the pattern look a bit messy. Idk if its possible to salvage this now, so if you find it too hard to fix, its whatever. 01:19:060 (1,2) - This pattern can be improved visually imo. First, try and make 01:17:771 (1,1) - parallel. Then try and fit 01:19:704 (2) - in a way that makes it structurally equidistant with 01:17:771 (1) - 's head. Basically something like this, if you can. 00:55:225 (3,1) - The spacing is too big. Compare it to 01:00:378 (2) - . Pretty clean patterns overall. I think the set could still benefit from some minor polishing, like fixing blankets, avoiding unnecessary / unclean overlaps, etc... feel free to ask for another mod or two, or go over the set yourself and self-mod. You can call me back when you feel the set is ready, but I won't be happy if I see blanket issues still, cuz they're not something I should be pointing out .